Okay, friends - this is the first post actually FROM the garden. I'm sitting on the bench you see in the picture below. RIGHT. NOW. I have branched away from my "terrestrial" computer and camera and am blogging this completely using my iPhone. I took the images with my phone and uploaded them via this new mobile blogging tool. I will say that I am nervous about the formatting that will publish from this app (which logs into my Blogger account and says it does everything I can do from my desktop. Also new is that I am typing this completely on my iPhone, I am using a Bluetooth Keyboard, which connects to my phone and allows me to type using a full-size keyboard with my iPhone as the "monitor." 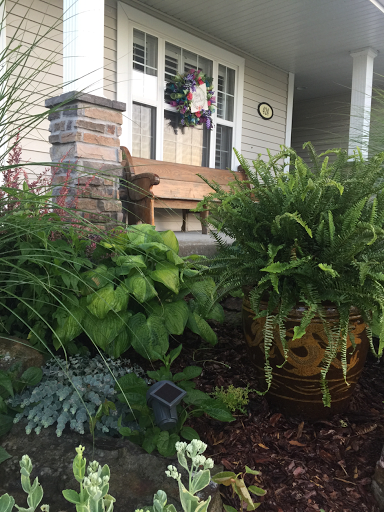 So, the moral of the story is I can now blog Daylilies from wherever and whenever I am- video included. This technology has been around for a while, actually, I just could never get myself to trust that the iPhone could share my message like I could sitting in front of my 27" desktop monitor, but that's not the case at all. It's why I haven't posted much since spring- I just can't find the time to sit in front of the computer and massage the message like I used to because I'm too busy living the moment. But I missed sharing them with you, too. So this is the solution - MOBILE BLOGGING using an app that connects to my existing Blogger, importing photos taken on my iPhone, and typed on a Bluetooth keyboard linked to my iPhone. 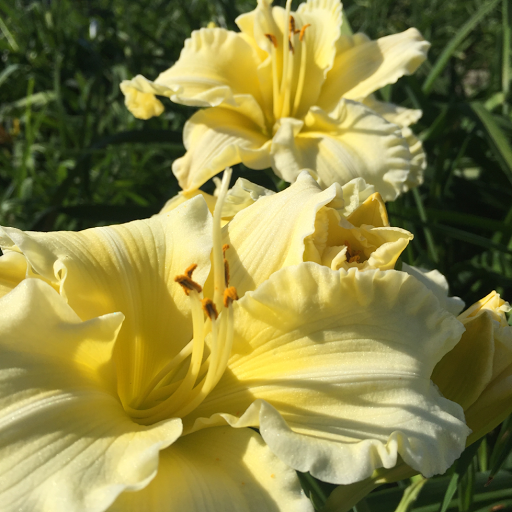 I'm not convinced that everyone has gone to Facebook to enjoy Daylilies- I think some of you still enjoy a deep-sit of a read. So, let's get back to that. Here are photos I took in my own seedling beds yesterday. This is one of the first crosses I ever actually planned and sought out, and I kept three siblings from the 40 seeds! It is the most diamond-dusted thing I have seen in my own garden. And it seeps with fragrance. I measured these blooms at 5" (I wish it were much smaller) and the scape is about 28". Just perfect for the front of the border or a night garden centerpiece. She will be introduced this Fall! If you search the blog tags for 'seedling' I think you'll find pictures of her from the last few years and you will enjoy seeing how she has matured. I just love her. 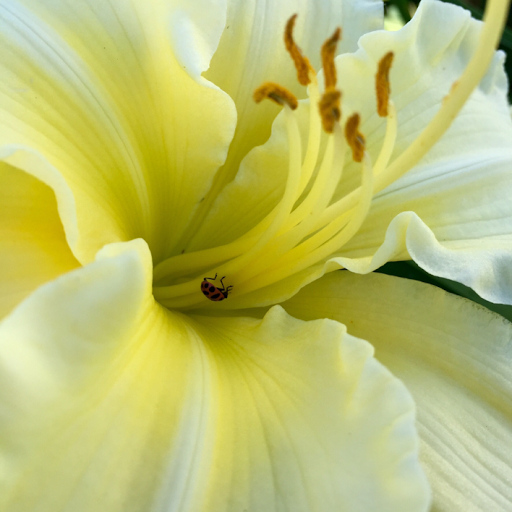 Instagram is also hopping with #daylily. Join in on the fun if Insta is your thing. Welcome to our favorite time of year, friends. Here's to breathing in each day and being thankful for another chance to share it in new ways.